The C.O.M.B.A.T. initiative is set to bring together veteran members of motorcycle associations and clubs as one unit, regardless of custom, tradition, culture, or location, to support the Camaraderie Foundation and communicate their message of saving lives and families of veterans, who have fought for us, while they fight their demons of despair, heal their invisible wounds of war, and erase their scars of sacrifice. Trauma – the invisible wounds of war. Any veteran rider member of a motorcycle association or club, from now on known as “member”, can join the C.O.M.B.A.T. initiative to donate money, volunteer their services and skills, and/or participate in direct support of any events, activities, or rides organized by a member, member association, member club, the Camaraderie Foundation, or the C.O.M.B.A.T. initiative itself. A single veteran member belonging to a motorcycle association or club can advocate membership for their association or club. Participants in C.O.M.B.A.T. sponsored rides earn loyalty rider miles. These miles are tallied annually to determine the winner of the annual award. 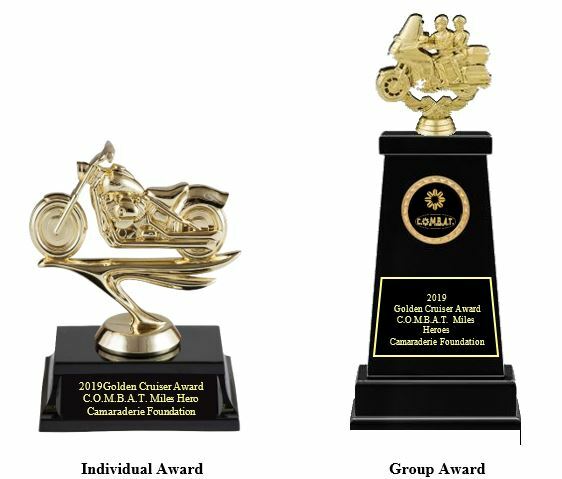 Yearly Award: The rider and group with the most earned miles will win a Golden Cruiser trophy. Participation Certificates: Every rider and group will receive a certificate of appreciation. Program Process: Participating riders’ membership or program number is linked to the program. When they arrive at the event, they sign-in under their membership number. Once the ride is over, the participants sign-out completing their entry. Tools: Participating riders will use their membership card or program number. An online signup form will be located at each event which will record the program member’s number. The database is controlled by headquarters. Adopt-A-Vet by sponsoring a Camaraderie Foundation client. All monies raised by that adopting individual or group (guardians) will go directly to that veteran’s and their family’s counseling sessions until the completion of their Camaraderie Foundation care (excludes outside referrals for long term counseling). 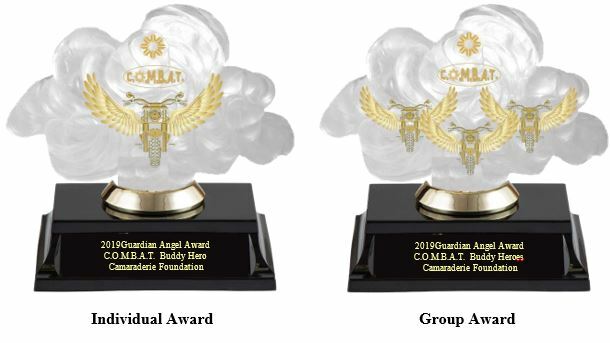 Yearly Award: The guardian with the most earned donations will receive the Guardian Angel trophy. Participation Certificates: Every guardian will receive a certificate of appreciation. Program Process: Participating guardians’ membership or program number is linked to the program. Guardian will receive a client’s road name (or alias) only (due to HIPPA compliancy). Any event or ride that the guardian rides in is recorded and monies paid at the event, by the guardian, will go directly to the client’s foundation account. If the guardian is sponsored by an organization, the recorded miles and/or matched donations will also go directly to the client’s foundation account. The database is controlled by headquarters. will be located at each event which will record the program member’s number. The database is controlled by headquarters. The No Soldier Left Behind campaign reminds us of those veterans, from the previous year, that still need our guidance and comfort. The Heart, Mind, and Soul campaign encourages compassion, self-awareness, and motivation for our brothers and sisters in need. Americans recognize and honor military caregivers’ sacrifices and successes. Organize and conduct a Cap and Tassel Run (escorted) celebrating graduating clients. We recognize military children and youth for their heroism, character, courage, sacrifices and continued resilience. A day to acknowledge the contributions and sacrifices of the spouses of the U.S. Armed Forces. PTSD Awareness Month encourages everyone to raise public awareness of Post-Traumatic Stress Disorder and effective treatments, and how we can all help those affected by PTSD. National PTSD Awareness Day is a day dedicated to creating awareness regarding PTSD. Started in 2009, the foundation gives counseling “scholarships” to veterans struggling to readjust to civilian life — or the families struggling to help them. Purple Heart Day recognizes not only the merit but more importantly the men and women killed and wounded in combat who have earned the badge of honor. It encourages people to pay their respects, to listen to the stories of soldiers and veterans, and to thank them for their service. Patriot Day remembers those who were injured, died, or affected during the terrorist attacks in the United States on September 11, 2001. National Day of the Deployed honors all of the brave men and woman who have been deployed, are sacrificing, or have sacrificed their lives to defend our country. Military Family Month recognizes and honors military families for their numerous contributions and daily sacrifices to the Army and the nation. Veterans Day honors those who served in the United States Armed Forces. 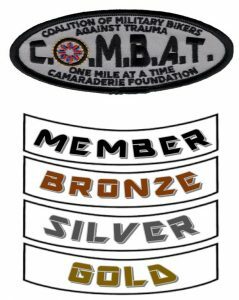 We celebrate the launching of the Camaraderie Foundation initiative – Coalition Of Military Bikers Against Trauma.